Johnny Gray held on to the No. 1 spot in Funny Car Saturday as qualifying came to an end at the NHRA Arizona Nationals at Firebird International Raceway. Shawn Langdon and Mike Edwards also were qualifying leaders in the Top Fuel and Pro Stock categories respectively at the second of 23 races in the 2012 NHRA Full Throttle Drag Racing season. Gray powered his Service Central Dodge Charger to a 4.074-second pass, the quickest lap of the weekend, at 298.93 mph Friday night and kept the top spot through Saturday qualifying to secure his second career No. 1 qualifying position. Gray will face Grant Downing in the first round of eliminations on Sunday. Recent race winner John Force qualified fifth in the field, while defending event winner Jack Beckman qualified sixth. Rookie driver Courtney Force raced to the 12th qualifying spot in the category, while Kalitta Motorsports driver Alexis DeJoria’s pass of 4.296 was not strong enough to secure her a spot in Sunday’s eliminations. Qualifying second in Funny Car was John Force Racing’s Mike Neff. Neff’s 4.096 second pass with the quickest of not just the last session but the entire day of qualifying on Saturday. It earned the Castrol GTX Ford Mustang driver three valuable qualifying bonus points. When Neff looked back at the weekend with his crew chief hat on that final run was just want the two-time world championship wrench turner was looking for. After setting the track record Friday night, Langdon kept his Al-Anabi Racing dragster in the top spot in Top Fuel through Saturday qualifying. Langdon’s Friday night pass of 3.754 at 323.12 stayed strong enough to secure him his second career No. 1 qualifying position. Langdon will pair up against Top Fuel pilot Troy Buff in the first round of eliminations Sunday. Three-time Firebird International Raceway winner Tony Schumacher secured the second spot in the field while Schumacher’s teammate Antron Brown locked in the fifth spot in the category. Schumacher is also hoping he can take over the Top Fuel class lead for career wins at Firebird. With three Arizona Nationals trophies in his possession, he’s tied with Larry Dixon and Cory McClenathan on the list. In Pro Stock, Edwards took the top spot away from Friday qualifying leader Jason Line when he powered his Penhall/Interstate Batteries Pontiac GXP to a 6.536 at 210.80. The pass not only set the track record for time, but also secured Edwards his 40th career No. 1 qualifier, fourth consecutive at Firebird International Raceway and fifth overall at the track. Edwards will face NHRA legend Warren Johnson in the first round of eliminations on Sunday. Line qualified second for the event and recent race winner Anderson qualified fifth. 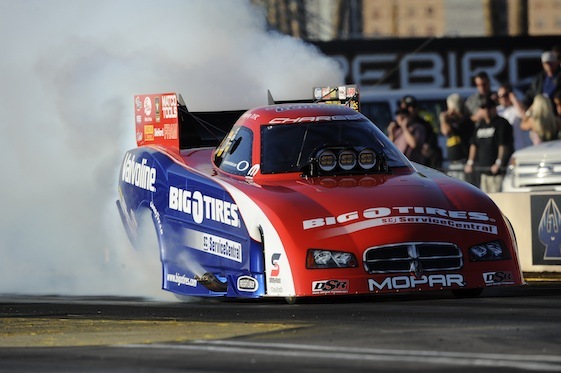 Eliminations for the NHRA Arizona Nationals begin Sunday at 11 a.m.
Sunday’s first-round pairings for professional eliminations for the 28th annual NHRA Arizona Nationals at Firebird International Raceway, the second of 23 events in the NHRA Full Throttle Drag Racing Series. Pairings based on results in qualifying, which ended Saturday. DNQs listed below pairings. Top Fuel — 1. Shawn Langdon, 3.754 seconds, 323.12 mph vs. 16. Troy Buff, 7.720, 299.66; 2. Tony Schumacher, 3.783, 324.44 vs. 15. Mike Strasburg, 4.069, 245.32; 3. Steve Torrence, 3.788, 321.19 vs. 14. Brandon Bernstein, 3.871, 314.46; 4. Spencer Massey, 3.795, 323.81 vs. 13. Cory McClenathan, 3.864, 314.61; 5. Antron Brown, 3.796, 320.36 vs. 12. Terry McMillen, 3.857, 313.73; 6. David Grubnic, 3.803, 321.96 vs. 11. Clay Millican, 3.846, 316.60; 7. Doug Kalitta, 3.804, 317.19 vs. 10. Bob Vandergriff, 3.824, 320.20; 8. Morgan Lucas, 3.813, 315.64 vs. 9. Khalid alBalooshi, 3.823, 316.15. Funny Car — 1. Johnny Gray, Dodge Charger, 4.074, 301.07 vs. 16. Grant Downing, Charger, 4.250, 289.63; 2. Mike Neff, Ford Mustang, 4.096, 307.51 vs. 15. Bob Bode, Chevy Impala, 4.224, 296.24; 3. Jim Head, Toyota Solara, 4.107, 297.29 vs. 14. Jeff Arend, Solara, 4.201, 298.54; 4. Matt Hagan, Charger, 4.110, 305.56 vs. 13. Todd Lesenko, Impala, 4.195, 289.51; 5. John Force, Mustang, 4.115, 307.51 vs. 12. Courtney Force, Mustang, 4.180, 297.75; 6. Jack Beckman, Charger, 4.124, 303.43 vs. 11. Tony Pedregon, Impala, 4.142, 293.86; 7. Cruz Pedregon, Solara, 4.129, 297.75 vs. 10. Ron Capps, Charger, 4.134, 296.05; 8. Robert Hight, Mustang, 4.132, 304.32 vs. 9. Bob Tasca III, Mustang, 4.134, 307.72. Did Not Qualify: 17. Alexis DeJoria, 4.296, 291.82; 18. Gary Densham, 4.348, 275.73; 19. Tim Wilkerson, 4.435, 242.36; 20. Jeff Diehl, 4.610, 201.04. Pro Stock — 1. Mike Edwards, Pontiac GXP, 6.536, 211.76 vs. 16. Warren Johnson, GXP, 6.626, 207.50; 2. Jason Line, GXP, 6.539, 211.10 vs. 15. Jeg Coughlin, Dodge Avenger, 6.624, 209.04; 3. Ronnie Humphrey, GXP, 6.543, 211.16 vs. 14. Greg Stanfield, GXP, 6.604, 209.75; 4. Vincent Nobile, Avenger, 6.549, 210.70 vs. 13. Shane Gray, GXP, 6.603, 208.46; 5. Greg Anderson, GXP, 6.556, 210.64 vs. 12. Kurt Johnson, GXP, 6.602, 209.49; 6. Allen Johnson, Avenger, 6.564, 210.44 vs. 11. Larry Morgan, Ford Mustang, 6.597, 210.01; 7. Erica Enders, Chevy Cobalt, 6.567, 210.41 vs. 10. Steve Kent, GXP, 6.596, 209.07; 8. Ron Krisher, GXP, 6.573, 210.21 vs. 9. Rodger Brogdon, GXP, 6.593, 209.39. Did Not Qualify: 17. Grace Howell, 6.645, 206.54; 18. V. Gaines, 6.666, 207.66.